Denise: my sister, my friend. My sister, Denise, passed away this time last year after a long battle with illness. The following post is a transcript of the words I spoke at her funeral, which I choose to share today by way of tribute. I have so many memories of D that it is hard to know where to begin. I guess it makes sense to start when we were kids, growing up together in Poole. Fighting over the best seat for watching Saturday morning telly or who got to use the arm-rest in the back of one of the many cars we had growing up. Denise was always very active. She would play games like ‘block’ and cricket outside on the green in front of our house, not to mention inventing a dance routine with a couple of the neighbours. She did like to dance, as I remember. Something which I am sure she did plenty of during the various holidays to sunny places that she loved to go on with friends. She attended a dance school for a while, too. Denise was also very fond of animals, having a great deal of affection for the pets that passed through our lives. I remember her once defending our dog, Lucky, from a classmate of mine who was teasing her. Denise couldn’t stand to see people being unkind to defenceless creatures, and there were times when I fell into that category too. Her geeky younger sister occasionally needed protection from bullies. Don’t get me wrong, we would scrap as sisters do, but she was very loyal if anyone else tried picking on me. I certainly must have been the typical frustrating younger sister, but there is no doubt that her more ‘savvy’ presence in my life helped me to better navigate the pitfalls of growing up, especially as a teenager. I can’t say I appreciated the make-overs she would give me – especially the way she would use my nose as a lever to move my head around – but at least I know how to apply make-up as a result. D was very good at that kind of thing, being a beautiful person with an innate sense of style. She even persuaded me that I could actually wear skirts and dresses, rather than always living in my jeans. She would be the first to tell me when my hair needed a cut, though. She would be right, too! Den’s creativity and style also came out in other ways. There are any number of artistic items in my parents’ house courtesy of her. The ones that spring immediately to mind are the immense cross-stitch of a tiger in their living room, which must have taken her a great deal of time and patience to create, as well as a beautiful screen-print she produced at school. She could turn out some tasty cakes and excellent meals too. D would also ensure that the gifts she gave people were exquisitely wrapped, and the gifts themselves would be very carefully chosen, as would cards for birthdays and other special occasions. She had a lovely way of remembering the events which were important to people; even texting me ‘good luck’ on the day I started my new job recently, despite being so very unwell in hospital. I really appreciated that about her. By far and away my best memory of D is when Mum and Dad were unable to attend my wedding to Jeff due to illness. She stepped in at the very last minute to give me away. Now, as many of you know, D was never at her most comfortable in front of crowds, so this took her a great deal of courage. She did it, though, and she did it very well – for which I will always be grateful and always remember. I have been looking in the mirror recently, and lamenting the fact that I am now middle-aged. I’m not going to do this any more. From now on, I intend to live my life to the full, enjoying the privilege of getting older – a privilege Den has been tragically denied. I will take everything I ever learned from having her as a loyal, loving and feisty sister and put it to good use. In this way, she will live on in me, as she will live on in the hearts and minds of everyone who loved her. This is, I think, a fitting tribute to a short yet vibrant life – and one I believe would bring a big smile to D’s beautiful face. First score of years – discovering who I was not. Next score of years – finding out who I was. One more score and ten to go. I hope to use them well. In response to a challenge to write something on the theme of perseverance in thirty three words, unsurprisingly. Created around the time I turned forty. Also unsurprising. Once again, my online life has suffered at the hands of real life. Consequently, I am dropping by quickly to redress that by telling you about the poems-and-pints-open-mic-thing which I help to co-ordinate. Writers Aloud takes place on the second Wednesday of the month, every other month, at a local pub called the Goytre Arms. Excellent food starts the evening for some of us, with the rest turning out later to lubricate the vocal chords with fine real ale (other alcoholic beverages are available) and share our work with each other. The most recent evening took place on 9th April (I *did* say it had been a while since I last posted) and was the usual relaxed mix of poetry, prose and banter between good friends. The Facebook page for Writers Aloud can be found by following this link and you may find out more about the Goytre Arms by clicking here. Verse in Unexpected Places took a new turn this weekend, during a visit to Cheltenham. Whilst walking with friends around the town centre, I spotted the words ‘Free Art’ above a little bag which was stuck to the window of an empty shop. Never one to miss an opportunity, I took the offered freebie, finding it to be a couple of beautiful handmade bracelets. 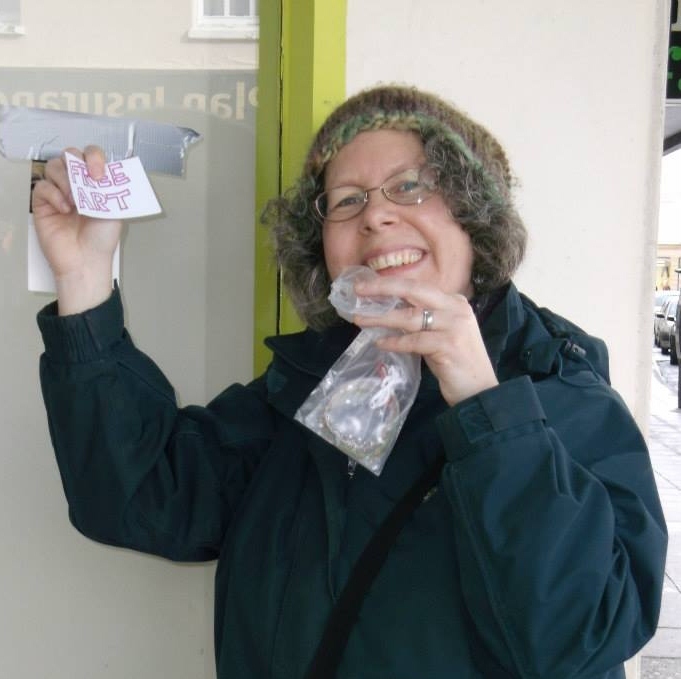 The note enclosed directed me to the Free Art Friday Chetltenham FB page, and I duly posted a picture of myself and my gift as requested. I then returned the favour by using the tape on the window to hold one of my unexpected verse postcards. The rest of my meander around the town was accompanied by leaving more cards in strategic places. I figured that Cheltenham during the Folk Festival would be a perfect time to do so. If you are reading this blog as a result of finding one, or being sent it, please leave a comment to let me know. I would love to hear where they have got to, and who is reading them. Those of you who know the work of William Carlos Williams will recognise this as being a tribute to his poem ‘The Red Wheelbarrow’, which we studied in class sometime last year. As with the foot poem in my previous post, I initially wrote ‘Unwed Welsh Boyo’ as a bit of nonsense. Once again, I was surprised at the positive comments it received. So, when an slightly daft scheme involving postcards popped into my head, this poem was an obvious choice. I took it and printed it on a postcard along with the picture of the steam train which I am using as the new header for my blog. I then had one hundred copies made, and subsequently started the process of release. Free the postcard hundred! So far; trains, station waiting rooms, platforms and even the loos at one station (by the hand drier) have become temporary homes for these creations. Only a few cards abound in the wild at present, but this will change over time. The more observant of my readers will notice that this photo shows me pointing to the poem from the previous post. (Pedants will notice that my hat is actually on, but that’s what comes from being a pedant.) Anyway, metaphorical and literal hats aside, in this first blog post of 2014 I will be looking back at my adventures in writing over the past year. My first success of 2013 was achieving pulication in PAN, the creative writing magazine of University of Wales, Newport. If you are interested in reading the poem ‘My Welsh Roots’, it can be found here. I also have a few copies of PAN. As my vanity realistically needs no more than one, I would be happy to give a copy to each of the first three people to leave a comment on this blog post, or who contact me via Facebook or Twitter. Later in the year, I was pleased to win a place in a competition co-hosted by IdeasTap and Mardibooks. This resulted in my ballad ‘The Inauspicious Beginnings of M. Parapluie’ being published in this anthology. 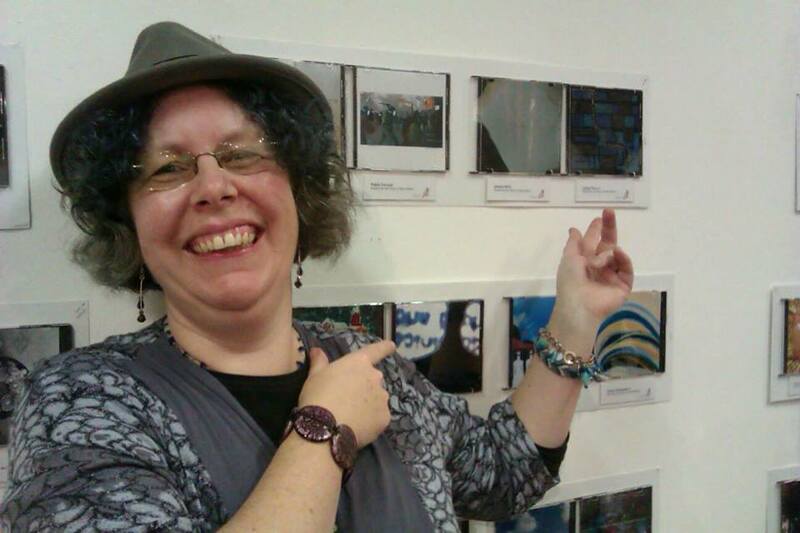 November then saw the exhibition of my visual poem ‘The Pursuit’, as demonstrated by the woman with the big grin and multiple chins in the above photograph. Trosnant Writers, a group of fellow scribes to which I belong, published our second anthology in March. The launch event for this collection was such a success that it has since become a regular fixture, in the form of Writers Aloud. I have facilitated and participated in a number of these evenings, enjoying the chance to hear the work of others as well as reading my own. Other opportunities to perform also emerged as appearances on Flame Radio, a locally run and charitably funded station which sadly went off-air recently due to lack of resources. Believe me, though, it was fun whilst it lasted! Time for a conclusion. As readers of earlier incarnations of this blog will know, it has metamorphosed since I first started. Early attempts at providing a platform for others to tell their stories was not as successful as I had envisaged, with the addition of my own personal tale creating no real improvement either. Furhtermore, feedback from a professional editor added to my growing conviction that I am not ready to tell my personal story, especially as making my experiences more appealing and readable would require a level of honesty and vulnerability that I am not yet willing to display. Honest reflection over the past year would suggest that my natural medium is poetry. I enjoy writing poems; I revel in the experience created when others encounter them, whether in written, visual or audible form. I have to admit, I particularly enjoy performing poetry. In October, I felt able to call myself a writer. Perhaps I will now add my particular specialism. My name is Dith Parry, and I am Performance Poet!